Fiber optic networks have evolved over the last 40 years. Patch panels and other solutions that were designed for phone networks were adapted for use in the data world. But the growths and demands of the data center environment beg for a new solution. Budget constraints and the rising cost of floor space require a new paradigm in provisioning a passive fiber optic solution. The Chameleon High Density Cassette Module takes full advantage of the MT multifiber ferrule design. The Chameleon proprietary cable management design gives users the benefits of increased cordage stability while maintaining minimum bend radius. 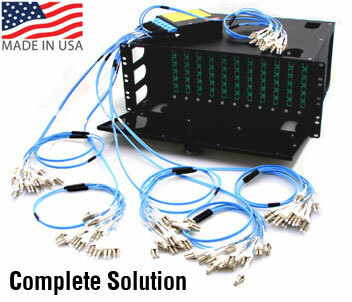 Multimode OM3/OM4 and Singlemode OS2 optical cassettes come loaded with pre-terminated and pre-tested LC to MTP fiber harnesses in 48 or 96 fiber configurations.